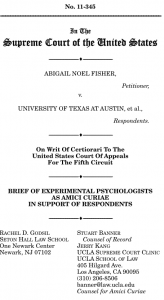 We’ve just filed an amicus brief on behalf of Experimental Psychologists in the Fisher v. Univ. of Texas case. It discusses the phenomenon of stereotype threat. The scientists taking the lead are Greg Walton (Stanford) and Steve Spencer (Waterloo). Nearly all the major researchers on stereotype threat have signed on. Stuart Banner and I, from UCLA, and Rachel Godsil, from Seton Hall, are the lawyers. Brief of Experimental Psychologists. et al. as Amici Curiae Supporting Respondents, Fisher v. University of Texas, (August 13, 2012) (No. 01-1015). In a reference list the APA will use the bluebook style. Citing the brief within the text of an article the APA would use: Brief of Experimental Psychologists, (2012). For other amicus briefs, SCOTUS Blog keeps a list, which should be updated soon.